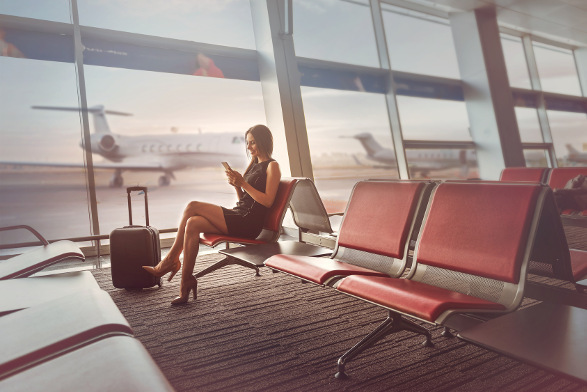 Upington International Airport, previously known as Pierre Van Ryneveld Airport, emerged from humble beginnings to become one of the best small airports in Africa. It is also home to one of the longest runways in the world. The airport was opened in 1968 and has since operated as a refuelling station, a training ground for pilots, and hub for international exports. Upington International Airport (IATA code: UTN) currently only serves domestic departures and arrivals to other destinations in South Africa. It also offers connecting flights to the major airports for international departures. Domestic airlines that land here include: SA Airlink. UTN is a 10-minute drive from the heart of Upington. Book your cheap flights to and from Upington International Airport online! Upington International Airport is the gateway to the Green Kalahari and the Northern Cape. Although it is one of the smaller airports in South Africa, it is home to one of the longest runways in the world: a NASA space shuttle could land on this 4900-metre runway. The South African Airforce and South African Airways train their pilots in handling larger aircrafts at Upington International Airport. The airport was originally a refuelling station for two weekly flights to London and Zurich but is now a hub for domestic departures to other destinations in South Africa. It also serves as an international cargo hub for cars, livestock, mining equipment and grape exports to Europe and other countries around the world. There are currently no shops at Upington International Airport except for a small kiosk/coffee shop. This can be found near the departures area. Upington Mall is situated just 6 minutes from the airport. Currently, there are no VIP lounges at Upington International Airport. The following facilities are available at the airport: conference room, first aid, telephones, viewing deck, prayer rooms, and disabled facilities. This 3-star guest house is situated just 7 minutes from Upington International Airport. Some of the amenities on offer include room service, shuttle bus, air conditioning, daily housekeeping, laundry service, and barbecue grills. Breakfast is also available, as well as free parking and Wi-Fi in the lobby. This 3.5-star bed and breakfast is a quick 6-minute drive from Upington International Airport. Amenities include a swimming pool, air conditioning, laundry service, and breakfast. Complimentary parking and Wi-Fi in the lobby is also available. This 4-star lodge is a 9-minute drive from Upington International Airport. The lodge offers a range of amenities, including two swimming pools, river deck, air conditioning, restaurant, garden, and barbecue facilities. Free parking and Wi-Fi are available. Most exchange bureaus in South Africa allow you to exchange currency up to 60 days before leaving the country. Parking options available at Upington International Airport include free parking for up to 58 cars. Sheltered and uncovered parking bays are available. Upington International Airport is located just 6 km outside the city of Upington. Several transport options are available at the airport which will get you to your destination. These include: Shuttle bus, metered taxis, and car hire. Several car hire agencies are located at the airport.